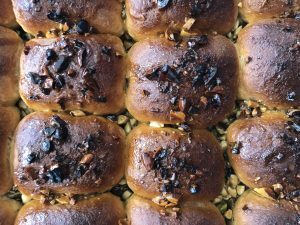 These buns are made with a subtly sweet brioche like dough, soft and fluffy. They are topped of with a honey-caramel flavored with vanilla and mixed with chopped up nuts, you can use any kind of raw nuts of your choice; I used pistachios and almonds. Shredded coconut also works really well if you can’t eat nuts. In my video I kneaded the dough by hand, but if you have a stand mixer, you can make this using it with the dough hook. This is an awesome weekend breakfast with a strong cup of coffee or earl grey tea. In a large microwavable bowl heat up butter and honey, just until both are melted. Add in the milk, whisk, then crumble in the yeast and whisk until the yeast has completely dissolved. Add in your egg and whisk until smooth. Add flour and salt to wet ingredients and fold with a spatula until the dough comes together into a ball. Dump dough onto a lightly floured surface and start kneading until you get a smooth and slightly tacky dough (this may take 10-12 minutes), it should be at a point where you can gently toss the dough from one hand to the other without it sticking to them. As you are kneading your dough you will need to flour your surface a few times in between, in the beginning you will need to do it more often, then towards the end it shouldn’t be as sticky. If you are doing this in a stand mixer with a dough hook, knead on a low speed for 2 minutes, then on medium speed for 8 minutes. Once your dough is ready, oil the same bowl you mixed the dough in, shape your dough into a ball and stick it in the bowl, coating all sides in the oil so it doesn’t form a dry skin. Cover your bowl with clingfilm, a towel, or wrap it in a large plastic bag. Let it rise for 45-55 minutes or until it has doubled in size (I let mine rise in the microwave, it is very well isolated; you can also leave it in your oven, switched off of course). Preheat oven to 180ºC without fan/ventilation. Grease a 9x13 inch deep baking dish and line the bottom with parchment paper. Punch your risen dough down, then transfer it to a lightly floured surface.Divide the dough into 16 pieces (if you want to be precise use a scale and measure about 65 grams per piece). Shape one at a time, flatten it out with the palm of your hand, then fold all of the edges to the middle, flip it over onto its smooth side and roll it into a ball (it doesn’t need to be perfect). Place each ball into your pan, giving them even spacing, a 4x4 arrangement is good. Set the pan aside while you prepare the honey nut topping, your buns will also have time to proof for 10-15 minutes this way, which will allow them to get more light and fluffy after baking. In a medium sauce pot combine your honey, sugar, and butter; place on medium heat and allow everything to melt completely stirring occasionally. Then boil for 6 minutes, the color will turn from a yellow to a caramel color.Remove the pan from the heat. Add in your chopped nuts, salt and vanilla; stir well and set aside to cool for 6-7 minutes. Spoon your slightly cooled topping over the buns and try to disperse it as evenly as possible (don’t worry it will spread out more evenly in the oven). Place in the oven and bake for 30-35 minutes or until a skewer inserted in the middle comes out clean. Allow them to cool for 10-15 minutes (so you don’t burn yourself), then you can enjoy! You can eat these buns slightly warm or at room temperature. Store covered at room temperature for up to 3 days. To use active dry yeast: warm up about 1/2 of your milk in the microwave until in feels very warm but not hot when you place your finger inside, add yeast and 1 tsp white sugar, whisk until combined. Let this rest for 5 minutes then add it in the recipe, when you add the rest of the milk. You can also make this into 24 smaller buns (about 43 grams each).